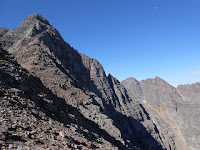 Perhaps the most popular mountain in the San Juan Range is Mt. Sneffels near Ouray, Colorado. In the northern part of the range, Mt. Sneffels is one of the iconic and spectacular peaks on the area. The view of its jagged and complex north face has been seen in many photographs, especially in the fall when the colors come out. 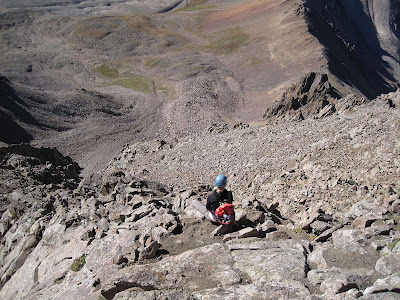 As a mountaineering destination, Sneffels is top notch for a number of reasons, including its ease of access and variety of routes of various difficulty from 2+ to 5.6. This popular route is accessed from Yankee Boy Basin via the town of Ouray. The route follows a dirt road (passenger cars can park at 11,000) up to a high parking lot near Wright Lake at 12,300'. 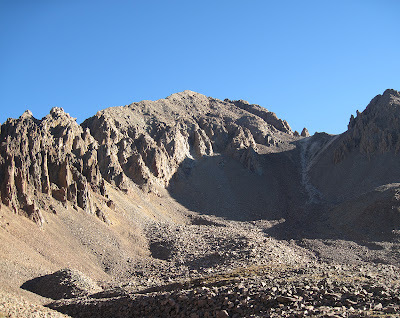 From here you follow a fainter trail into the scree, taking a right at a fork (not towards Blue Lakes Pass), to the base of a large scree-filled gully that angles up the mountain to the north. The route climbs this gully to the saddle between Sneffels and Mt. Kismet at 13,500'. From here the route turns west up a steep, obvious couloir band climbs through a short notch, arguably the route's crux and possibly a brief class 3 move. A few small ledges and the summit appears. 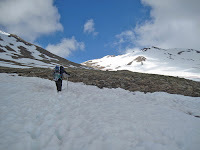 A more difficult option from Yankee Boy Basin follows the standard route into the scree and instead of turning right at the junction, follows the main trail left towards Blue Lakes Pass. From Blue Lakes Pass the route turns up the southwest ridge, dodging some large gendarmes and towers on the west (left side). Climb a steep couloir (class 3) to prominent notch, downclimb and track along some cliffs and into a steeper, looser couloir (class 3). Exit the couloir at a steep crux (class 3+) and finish on some airy slabs for the last couple hundred feet (class 3-). This classic route on Sneffels' famous north face is one of Colorado's best snow routes when the conditions are good. Reached from Blaine Basin, this route follows the western part of the north face. The potential for avalanches is omnipresent, so bring a beacon and know what you are doing. Usually people descend the East Slopes route, which follows the South Slopes route down the couloir from the summit to the saddle between Kismet and Sneffels. Instead of turning down the scree-filled basin back to Yankee Boy, however, the east slopes route turns east-northeast and descends back into Blaine Basin. A quality rock route in a range known for its crumbling choss. This excellent route follows a prominent buttress in-between the Snake Couloir and the central of the north face's three main couloirs. Climb a pitches of moderate climbing and descend the East Slopes route as described in the Snake Couloir description.